This past summer, my family and I traveled up north and visited Hershey Park in Hershey, Pennsylvania during our vacation. In addition to Hershey Park, we also visited Washington D.C., Mount Vernon, Amish Country, and Wheatland in Lancaster, Pennsylvania. Now, a couple of months later, my four year old twins still talk about the day at Hershey the most. I’d like to hope some of those glorious historical sites planted some seeds of love of history and stories, but that will remain to be seen down the road. They want to go back to Pennsylvania, stay in the hotel, and go back to Hershey. The day at Hershey, though, showed me some insight into the members of my family. Wonderful hubby. Let’s start with my wonderful hubby. I like to think we balance each other. He’s my rock, and I remind him to buy deodorant with antiperspirant instead of just deodorant. This day reminded me why he’s great at strategy games and planning. He wisely chose to purchase the add-on fee to park next to the park entrance. With twin four-year olds, it was the best spent money on the trip. By the end of the day, Cupcake was tuckered out, and wonderful hubby and I were each carrying a twin out to the minivan. I was so thankful he indulged with that nearby parking spot. Kath. It’s hard to believe that the little girl who twirled on the fireplace hearth is now in high school. Her boyfriend lives in Pennsylvania, and he accompanied us to Hershey. They toured Zoo America on their own and also went on some of the roller coasters while touring the park on their own. Kath still talks about her reaction to the dips and turns of one of the coasters, but she participated in the rides without us. In two years, she’ll head off to college, and she’ll live in a dorm away from home. Hershey Park drove that concept into me, but we all still ate meals together and we all laughed together. But she’s now grown up enough to take that first step into her own life by riding the roller coasters with someone other than her parents. MJ. My tween son talked nonstop of the roller coasters prior to the trip, but then the moment came when he actually saw the roller coasters. Up close. He had no problem with the bumper cars or the Screamer. The Tilt-a-Whirl and the Pirate were right up his alley. But he discovered he’s not keen on roller coasters. I still don’t know what to make out of this. On the one hand, I want all of my children to live life to its fullest and face any fears they have. On the other hand, maybe this is a sign that my tween son is starting to develop some common sense that will guide him through his teen years and beyond. If something doesn’t feel right and some little worm of doubt grows within him, that might help him later in life. So as hard as it was to watch him not to get on the roller coaster, we had to go along with what he felt was the best choice for him. Cupcake. The most fearless of the bunch. She went on every roller coaster the park allowed her to ride. The Super Dooper Looper. No problem. 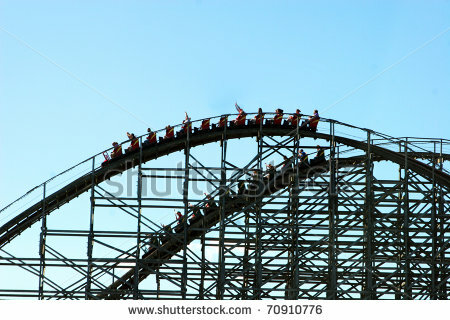 If it was a roller coaster and she was permitted to ride it, she was there. She not only rode every one she could ride, she rode some of them twice. (We were very fortunate to go to Hershey the first week after school ended in our neck of the woods while school was still in session in Pennsylvania. As a result, the park wasn’t crowded and we literally walked onto many of the rides, especially toward the end of the day.) She loved the roller coasters. She came back and reported every wonderful second of the ride to her twin brother and her older brother. She might look sweet and she might cuddle up to you, but this Southern belle has a spine of steel. Chunk. Cupcake’s twin brother didn’t cotton to roller coasters like Cupcake. He allowed his sister to go with Daddy on the roller coasters while he went off to another ride with MJ and Mommy. But the roller coasters were always in view. And by the end of the day, he wanted to try riding one. And then, he loved roller coasters. In the last hour, we rode two roller coaster before ending the day with a Tilt-a-Whiril ride and a final twirl on the Screamer. That’s Chunk. A little cautious at first, but then full steam ahead. The whole day was fun. From the wonderful ice cream dipped cone to ramming into Kath, Kath’s boyfriend and MJ in the bumper cars, it was a great day. What are some of your favorite family vacation moments? Let me know. Have you heard this old joke? What’s scarier than Friday the 13th? Saturday the 14th. Okay, so now you know the reason I’m a romance writer and not a comedy writer scouted by the likes of Stephen Colbert and Tina Fey. For those who don’t know me, my new running gag is that I’m the mother in a YA romance novel. My 16 year old, Kath, is dating an 18 year old who lives in a different state. As a mom, I’m great with her dating someone who lives five states away. This spring, 18 year old (shall we give him a nickname? Let’s not ask my wonderful hubby to provide this nickname. Let’s just call him-KB for Kath’s boyfriend-I know all of you will now line up to buy my first book with something as creative as that.) KB graduated from high school. Kath thought his graduation party &/or his Eagle Scout party would be taking place during my wonderful hubby’s vacation so we all decided to take a 12 hour car trip to Pennsylvania to visit KB. We all decide 5 A.M. is a good time to get the party started. By some miracle, we are actually all loaded and in the minivan by 5 A.M. At 5:05 A.M., Chunk utters the words, “Mommy, I need your iPad.” We were barely out of the driveway and Chunk is already bored with the car ride. At our first rest stop at the SC Welcome Center, Chunk runs his fingers through the grains on top of a garbage can: that’s right. The ones used for cigarette butts. He did not want to stop playing with the big ashtray. At least he was keeping Kath and MJ entertained. We make it along the first leg of our trip, all the way to Virginia where we spent the night. When we arrived at the hotel, MJ discovered he forgot deodorant. For the good of everyone in the car, we pile back in the car and go buy him deodorant. You’re welcome, Kath, Cupcake and Chunk. The next day we all go to the Smithsonian in Washington, D.C. When we pull into a parking deck, we were asked to open our trunk for security purposes. What we didn’t know was that our can of raisins ended up back there. The poor security guard who opened our trunk door had the can of raisins gush out of our car onto a sidewalk. They promptly waved us through. Chunk enjoyed touching a cannon fragment in the display before the Fort McHenry flag. He kept wanting to go back there the most. The rest of us did enjoy seeing treasured pieces of Americana. I especially liked Miss Piggy. And I also marveled at how small Bette Davis’ waist was when I saw the dress she wore in Dark Victory. It’s a beautiful city, and I’m proud of our nation’s Capitol, but we were happy to start the next leg of our journey. Especially Kath. She’d get to see KB the very next day. So we proceed to PA. We crammed a lot into a week: the State Museum of PA, Wheatland (our 15th President, James Buchanan’s house), a pretzel factory, Hershey Park, Zoo America, lunch at an Amish restaurant, Hershey’s Chocolate World, the York Emporium, and miniature golfing. Chunk provided our first ever visit to a medical first aid station at a theme park (the EMTs and staff at the Hershey Park First Aid Clinic were exemplary; I told Chunk to enjoy having two beautiful women fawn all over him). Cupcake made friends wherever she went, MJ liked making his own candy bar and Kath loved spending time with KB, including seeing The Fault In Our Stars with him on opening night. I’m used to the stereotype that we Southerners take our time to get from point A to point B. I didn’t quite know what to make of being chastised up North for walking on an escalator. I normally don’t like labels, but I have to laugh at this Southerner getting chastised for trying to get somewhere in a hurry. But let me hasten to add, that Northern hospitality is underrated and was wonderful. I kept apologizing everywhere I went for the loudness of my kids. People gave me an understanding look and said they were fine. Thank you, Pennsylvania. On the way back, I decided to wear my “Careful, Or you’ll end up in my novel” t-shirt. I am after all a write-at-home mom. On the trip up to PA, I edited my work in progress. While in PA, I kept up with my homework from an online writing craft class (A quick thanks to the wonderful and awesome Cheryl St. John for a great class). On the way back, I edited more and worked some more. My wonderful hubby knowing what a history buff I am surprised me with a side trip to the gorgeous and very historical Mount Vernon. If you haven’t been to this national treasure, I recommend the trip. So sometime shortly after midnight, we pulled into our driveway. Safe and sound. Full of little adventures and little stories. Full of memories that we’ll talk about for years to come.